As some readers may have seen, I have already posted one review of Gloria on this blog yesterday. As I explained in that post, I felt it was only fair to try and write a spoiler-free review as well. Heck, even the theatre programme to the show has sealed sections, only to be opened at the interval! So, for those unable to see the show, or those looking for more detail as to the storyline of it, then head across to my other, more spoiler-filled review of Gloria here. Gloria is the latest play by Branden Jacobs-Jenkins and was nominated for a Pulitzer Prize last year and it’s certainly a drama with a sharp, witty edge. It’s also a tale of two halves, through which the playwright skilfully explores ambition and when it becomes something more questionable, when circumstances present us with an opportunity to cash in on our experiences. Events are set in modern day New York, in the Manhattan offices of a popular magazine. In the culture section, three editorial assistants are starting their day according to their usual patterns. Studious, hard-working Ani (Ellie Kendrick) is already hard at work, a year in to her job and still possessing the positivity and enthusiasm for it. Dean (Colin Morgan) is late, inching towards 30 and five years in, feeling frustrated and hoping a book deal will give him an exit. Kendra (Kae Alexander) is even later than Dean, not that she gives a damn, as she begins what feels like her usual criticisms of her colleagues, their lives and the state of publishing in New York; it’s a place, she says, which used to have opportunities, but now has only the illusion of them. Together they banter, bicker, sing, mourn the death of a young pop star and deploy their pearls of wisdom to the team’s intern Miles (Bayo Gbadamosi), while driving the team down the corridor crazy by making too much noise, something their older, despairing colleague Lorin (Bo Poraj) regularly reminds them (although I notice Dean’s boss (Sian Clifford), who we hear about, but don’t see until Act Two, never complains)! It’s an incredibly funny, entertaining start, which has you quickly enjoying watching the exploits of this ambitious bunch and results in quite a lot of laughter. For those of us who’ve worked in an office environment, at least some of this will be familiar, regardless of the industry. Woven through all of their pranks, stories and discussions about their possible futures, is Gloria. She’s worked there for 15 years or so and is the magazine’s loner; she’s someone you smile at and are polite to, but have no interest socialising with elsewhere. This has only been reinforced by her poorly attended party the night before, at which only Dean and a handful of others made an appearance. Ani feels bad for not going, Kendra does not and Dean just wants to forget he was ever there. As an audience, we feel for Gloria. She also feels a little familiar from our own work lives and it is this familiarity of some aspects of the office dynamics and personalities, that ensures the emotional punch of Jacobs-Jenkins’s work later is all the more powerful. Indeed, the emotional reaction I had to the end of Act One (even though I suspected where it was heading) isn’t one I’ve had at the theatre very often. The personalities of the characters having been established already, Act Two shows us their world seven months later and what I loved most about Gloria was how the second half builds on everything we have seen in the first half to present an interesting commentary on how events and experiences effect us all in different ways and perhaps sometimes can bring out our less admirable qualities. It’s fascinating to see where these people are now and how they have changed and the writing fantastically mines the humour in some of the seemingly tasteless endeavours that have resulted from the recent past. The use of doubling for the actors in roles across the two halves of the play is also a brilliant choice. It provides a strange sense of continuity to the story, while also being a little unnerving. The production also benefits from a strong cast. Colin Morgan is perhaps the most well known (last seen on stage in Mojo) and, as usual, he is very very good, conveying Dean’s downward spiral from playful, sarcastic office worker, to someone struggling to put his life back together. Morgan also takes the role later of a frustrated IT guy, resulting in a return to the lighter laughs of the first half. I also particularly liked the acerbic character of Kendra, who is both likeable and unlikeable at once, due to her sharp, mean barbs, that often speak more truth than we’d like to admit and Kae Alexander brings her wonderfully to life. Ellie Kendrick (who you may recognise from Game of Thrones) plays Ani, as one of those sweet, hard-working types, who tries to get along with everyone and I also loved one of the other characters she plays, Callie, also an assistant and it is to her credit that each one feels distinct. Our moral compass is represented by Lorin, whose response to earlier events in the play is much different from the others and I left the theatre truly hoping he was successful. Interestingly, Bo Paraj is also the only actor who plays just one role, which seems to emphasise Lorin’s difference from the others as well. Director Michael Longhurst captures the brilliant wit of the play and I loved Oliver Fenwick’s lighting, which is used to great effect in the second half, to reflect the recollections of certain characters, slowly dimming at times, before growing brighter again as the moment passed. The settings of each scene are great and set designer Lizzie Clachan has created three different sets, all ideally suited for the play’s story and I particularly liked the contrast of the basic decor in the first office, with the flashy, colour-coordinated look of the later office location; the positioning of the company’s logo in the latter being suitably ironic. I thoroughly enjoyed Gloria for its biting humour and sharp dialogue and I won’t forget the powerful ending of Act One in a hurry. It makes you laugh with recognition, gasp with shock and then smile ironically at the resulting, differing behaviour of the characters. This may have been my first trip to a Branden Jacobs-Jenkins play, but it certainly won’t be the last (in fact I’m off to another one next week and am now looking forward to it even more)! Tickets are selling fast for this production, so I recommend you buy a ticket quickly before it sells out! Gloria runs at the Hampstead Theatre until 22nd July 2017. For further information and availability, visit the theatre’s website here. On Tuesday night, I took a trip to the Hampstead Theatre for the final preview of their new production, Gloria. It’s a strong piece of theatre, but one that creates a challenge when it comes to writing a review – spoiler-free or not? I usually try and avoid writing spoilers which give away anything significant to a play, particularly a new play, as I’m a big believer in an audience experiencing theatre fresh, without knowing its secrets in advance. However, to write everything I want to say about Gloria will inevitably result in giving away a core element of the story. I’ve therefore decided to try and write two pieces; this one and a spoiler-free review, which will be posted tomorrow. Warnings taken care of, on to the play itself. 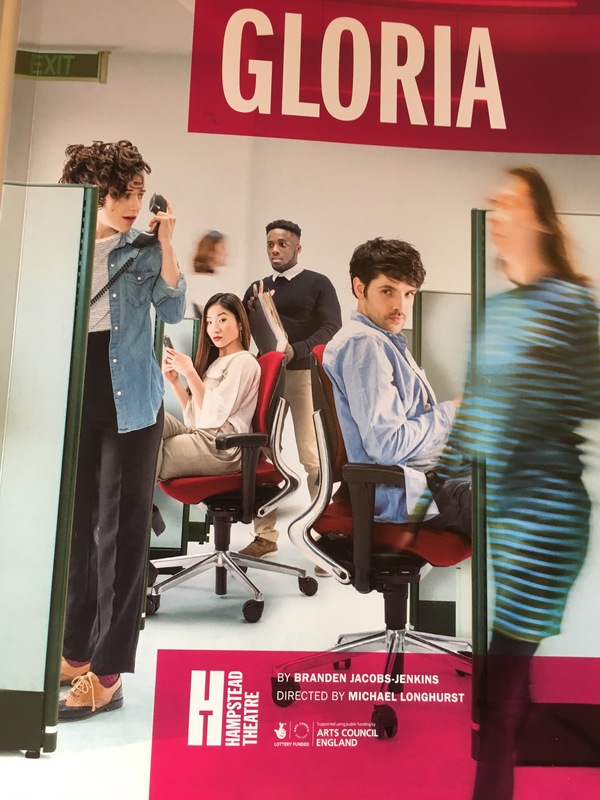 Gloria is the latest play by Branden Jacobs-Jenkins and was nominated for a Pulitzer Prize last year and it’s certainly a drama with a sharp, witty edge. It’s also a tale of two halves, through which the playwright skilfully explores ambition and when it becomes something more questionable; specifically when ambition collides with the opportunity to cash in on a tragedy. Together they banter, bicker, sing, mourn the death of a young pop star and deploy their pearls of wisdom to the team’s intern Miles (Bayo Gbadamosi), while driving the team down the corridor crazy by making too much noise, something their older, despairing colleague Lorin (Bo Poraj) regularly reminds them! It’s an incredibly funny, entertaining start, which has you quickly enjoying watching the exploits of this ambitious bunch and results in quite a lot of laughter. For those of us who’ve worked in an office environment, at least some of this will be familiar, regardless of the industry and it is this familiarity which makes what follows all the more frightening. Woven through all of their pranks, stories and discussions about their possible futures, is Gloria. She’s worked there for 15 years or so and is the magazine’s loner; she’s someone you smile at and are polite to, but have no interest socialising with elsewhere. This has only been reinforced by her poorly attended party the night before, at which only Dean and a handful of others made an appearance. Ani feels bad for not going, Kendra does not and Dean just wants to forget he was ever there. As an audience, we feel for Gloria. She also feels a little familiar from our own work lives. As the play moved through Act 1, I could see where it was heading, as Gloria sporadically appears, checking if everyone is in yet, growing increasingly erratic with each pass through the cubicles. Maybe it’s the impact of the last few months’s real life events, but the pointers to what was to come seemed clear to me. However, this didn’t detract from the emotional punch of Jacobs-Jenkins’s work, as Gloria’s isolated, unhappy feelings at the office spill over, resulting in violent consequences. It may just be a play, but it was nevertheless shocking to watch and I did find myself closing my eyes, so genuine was my response to the harrowing scene unfolding on stage. Indeed, it’s one of the most shocking ends to an act in the theatre that I’ve witnessed. The personalities of the characters having been established already, Act 2 shows us their world seven months on. What I loved most about Gloria was how Act 2 builds on everything we saw in the first half to present an interesting commentary on how horrifying events effect us all in different ways and perhaps can bring out our less admirable qualities. Dean, spared by Gloria for always being nice to her, has been, understandably, deeply affected by what he witnessed and is trying to piece his life together again, which includes the publication of a memoir, now altered to make Gloria its focus. He’s not the only one looking to cash in on the tragedy though, as we watch others indirectly affected by Gloria’s actions become seduced by the idea of their five minutes on fame (and a big cheque) and the writing fantastically mines the humour in their seemingly tasteless endeavours (including the editor’s fond recollections of the intern, whose name she doesn’t even get right)! The use of doubling for the actors in roles across the two halves of the play is also a brilliant choice, as it provides a strange sense of continuity to the story, while also being a little unnerving, especially with the reappearance of Sian Clifford, who after being Gloria, later returns as the editor we never saw in the first half. The production also benefits from a strong cast. Colin Morgan is perhaps the most well known (last seen on stage in Mojo) and, as usual, he is very very good, conveying Dean’s downward spiral from playful, sarcastic office worker, to someone still unable to comprehend what he survived and clutching to his book as a way to deal with it. Unlike some of the other characters’s need to make a quick buck off the story, I felt genuinely sorry for Dean, whose writing of his book, although a little possessive of the tragedy, seemed to be driven by his need to heal more than anything else. Morgan also takes the role later of a frustrated IT guy, resulting in a return to the lighter laughs of the first half. I also particularly liked the acerbic character of Kendra, who is both likeable and unlikeable at once, due to her sharp, mean barbs, that often speak more truth than we’d like to admit, but are possibly more of an act once we see her again in Act 2 and Kae Alexander brings her wonderfully to life. Ellie Kendrick (who you may recognise from Game of Thrones) plays Ani, as one of those sweet, hard-working types, who tries to get along with everyone, which only makes what happens to her more upsetting and it’s great that Kendrick is back in the second half as two further characters, spookily ending back as someone’s assistant and it is to her credit that each one feels distinct. Our moral compass is represented by Lorin, as the only person who isn’t seeking to profit from Gloria, simply wanting to put it all behind him (interestingly, Bo Paraj is also the only actor who plays just one role, which seems to emphasise Lorin’s difference from the others as well). Now studying for the LSAT exam, this is his second chance in life and you leave the theatre truly hoping he is successful. Director Michael Longhurst captures the brilliant wit of the play, while also building a subtle unease in the piece, which some of the audience may not even notice, but once you spot, you cannot ignore. This is also enhanced in certain moments (especially in the coffee shop scene) by Oliver Fenwick’s lighting. I loved how as characters started to recall upsetting memories or thoughts in act two, the lights would slowly dim, before growing brighter again as the moment passed. Set designer Lizzie Clachan has also created three different sets, all ideally suited for the play’s story and I particularly liked the contrast of the basic decor in the first office, with the flashy, colour-coordinated look of the later office location; the positioning of the company’s red splash logo on the wall in the latter being suitably ironic (and a little disturbing). I thoroughly enjoyed Gloria for its biting humour and sharp dialogue and I won’t forget the powerful ending of Act 1 in a hurry. It makes you laugh with recognition, gasp with shock and then smile ironically at the resulting, differing behaviour of the characters. It may also make you think about how you treat the people around you in your own office environment too. This may have been my first trip to a Branden Jacobs-Jenkins play, but it certainly won’t be the last (in fact I’m off to another one next week and am now looking forward to it even more)!